Exploring solutions to homelessness that go beyond providing money that could potentially save taxpayer dollars and keep people off the streets. Taking care of a person who is homeless is expensive. From emergency room visits to jail and court time for some, Utah spends almost $20,000 on each chronically homeless person a year, while New York spends closer to $40,500 per person. This suggests that money helps, or may even solve, the situation. But then why are 8 out of the 10 cities listed on USA Today’s 10 Richest Cities in America also listed on CheatSheet’s 10 Cities With the Most Homeless people? The short answer is that adding jobs and money to the equation does not actually help the homeless; however, providing homes and guidance for stability can. How much does each of the 5 cities with the most homeless people spend on their homeless population per year*? *Estimated amounts. Data pulled from various sources, calculated by total amount spent divided by total amount of homeless people. To fully understand the issue of urban inequality, let’s define homelessness. The U.S. Department of Housing and Urban Development prepared a packet on how to systematically count homeless populations. The packet subdivides homelessness into two categories: “Literally Homeless” and “Precariously Housed.” Those who are Literally Homeless are either in shelters or unsheltered and living in spaces that are not meant for human habitation such as abandoned buildings, streets, alleys, highway ramps, etc. 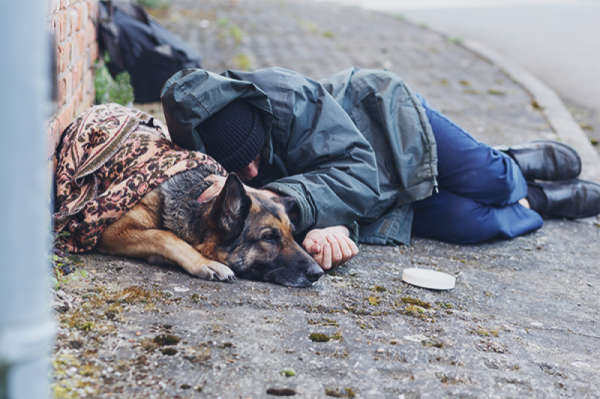 A person who is Literally Homeless is also sometimes referred to as, “chronically homeless,” or a lone individual often with disabilities and no proper sleeping place for over a year. The Precariously Housed are those who are on the verge of becoming Literally Homeless; their income isn’t sustainable for their fixed costs, or they’re being accommodated by friends and family. Both types of homeless populations are appropriately considered when a count is conducted. These counts must be administered in less than 24 hours, usually within a single night. Homeless outreach staff gather to do a basic count and work towards complete coverage of the city or a sampling using representative areas of the city. City department employees and even community volunteers are sometimes needed as well. To define it simply, gentrification occurs when a wealthier population migrates to a new neighborhood and seemingly improves the economic conditions of the community. There’s only so much space to occupy, so this often causes displacement of those who can’t afford to pay as much as the new population can. Displacement can then lead to homelessness. Adams Morgan is a neighborhood in DC, one of the states that occupies positions on both of those top 10 lists. Local residents debate about whether or not the urban development they face has a positive impact on the area. What’s undeniable is the fact that within the past few decades, the population size of the neighborhood has barely changed while “average real annual household income in [the] neighborhood went from $72,753 to $172,249” and the rate of diversity went from “51% white to 68% white” (GGWash); therefore, some form of displacement had to have occured. Interestingly enough, data shows that the neighborhood only built 57 housing units between 2008-2015, which means that gentrification can occur without physical development. In the case of Atlanta, physical development truly made a difference. The announcement of Arthur Blank’s $1.5 billion Mercedes-Benz Stadium caused rent prices to rise by 20 percent, according to a Georgia Tech study. The area’s own State Senator Vincent Fort said that, “the stadium deal is nothing but an engine for gentrification” (NYT). Blank has taken action to improve the lives of residents around the stadium due to their notoriously poor status. The Arthur M. Family Foundation donated $20 million to create programs like Westside Works to assist locals with their job searches. Unfortunately, jobs in a gentrification situation aren’t always helpful or permanent. Silicon Valley is a hub for innovation, yet its social economy is being disrupted by the very aspect that is creating its buzz: jobs. Daniel DeBolt, part of the Mountain View Tenants Coalition, mentions that her entire family has had to move to find housing with better price points for a working class. She says, “Every time there’s a boom in Silicon Valley, something like six times more jobs are created than homes built. People are casually displaced every day and $1,000 a month rent hikes are not uncommon. We have hundreds of people living on the streets now in RVs.” Lynda Lopez of northwest Chicago feels the same way. She believes that effort should be put into rent control and eviction laws instead of building new hotels. Lopez sees gentrification as a potential “loss of familiarity and home.” Cries from the community have come in the form of civil disobedience and rallies, but political officials often see gentrification as a renewing of the city. Some states and organizations believe there are more effective ways to re-incorporate the underserved than occupying their space. Instead of forcing job gains in an effort to end homelessness, Utah chose to focus on providing homes. That mentality drove their state rate of chronic homelessness down by 91 percent. Even when financial resources are available, it’s really the real estate dynamics that make it difficult for those who are homeless to re-incorporate themselves into society. The Housing First program in Utah allocates apartments and collects either $50 or 30 percent of income for rent, whichever is greater. Providing homes and case workers instead of inevitably paying for health and jail costs saves the state an average of $11,408 per chronically homeless person each year. Although this is not the the end-all be-all solution and does not necessarily account for the Precariously Housed homeless population, it seems to be a step in the right direction. This program has proven to increase self-confidence and motivate those who were previously homeless. A beneficiary of Housing First, Suzi Wright, was homeless for six years, traveling from shelter to shelter with her two sons. In an interview with NBC News, Suzi mentioned that it made her feel a lot better about herself once she was able to provide for her two sons, so she immediately pursued a job as a cleaning supervisor after being given a home. Those who struggle with drugs aren’t as exposed to substances and find it much easier to cope along with the help of case workers. North Dakota is another state that saw a drop in homelessness. A count from the North Dakota Coalition for the Homeless shows nearly a 61 percent decrease between 2012 and 2013. The executive director of the coalition says the results are mainly due to more beds at shelters and increasing help from church shelters. An oil boom drew many to northwestern North Dakota for work; however, many of them faced housing limitations, resulting in homelessness. This is yet another example that an increase in income does not serve as a solution to homelessness. The coalition is trying to improve their outreach in that area. According to the Coalition for the Homeless in New York, the proven solution for homelessness has three different parts. Financial assistance and job creation alone are unable to successfully solve homelessness. It requires prevention and stability, exercising the right to shelter, and housing-based solutions. When housing costs rise and incomes lower, especially in cases of gentrification, there must be an effort to help those facing eviction in the first place. Effort can come in the form of grants, but what could be more helpful and cost efficient is providing fair representation and legal services to those in housing courts facing possible eviction. Assistance with discharge from foster care and mental institutions has also proven to be quite effective. In some areas, such as New York, homeless men and women have the constitutional right to shelter as weather conditions can directly affect their health. This means that they can’t be turned away from municipal shelters since the New York State Constitution states, “the aid, care and support of the needy are public concerns and shall be provided by the state and by such of its subdivisions…” Many members of the homeless population in New York are protected under this right each day thanks to preceding court cases like Callahan v. Carey and Eldredge v. Koch. New York seems to be the only state where the right to shelter is widely known. Some places have passed a similar doctrine, the Homeless Bill of Rights, which protects the homeless population from segregation, allows them opportunities to vote, and provides access to shelter and counseling. Those places, however, only include a limited amount of cities and states: Baltimore (MD), Connecticut, Illinois, Madison (WI), Puerto Rico, Rhode Island, and Traverse City (MI). These locations are still only considering it: California, Colorado, Delaware, Duluth (MN), Hawaii, Knoxville (TN), Massachusetts, Michigan, Oregon, Pennsylvania, Vermont, and Washington, D.C.
Efforts to provide permanent housing have proven to be both successful and less expensive. Vouchers from federal housing assistance are a popular option. Permanent housing assistance started in New York and has been effective due to its dual-purpose of providing housing and supportive services for health issues. In the way that Utah is setting aside homes for its homeless population, housing-based solutions have kept a roof over many heads without costing the state as much as tending to homeless populations on the streets. The success of proven solutions can be highly affected by public opinion. Whether it is for or against homelessness, support for certain policies can alter the lives of the underserved. Generally, people want to help the homeless. Data shows that they are one of the most supported social groups; however, political scientists, Scott Clifford and Spencer Piston, have found that our biological emotion to protect ourselves from diseases encourages the support of such policies as banning the act of begging or laying down in public, and disputing homeless housing near us when it comes down to it. In fact, “A 2014 survey of 187 cities by the NLCHP found that 24 percent of cities make it a city-wide crime to beg in public, 33 percent make it illegal to stand around or loiter anyplace in the city, 18 percent make it a crime to sleep anywhere in public, 43 percent make it illegal to sleep in your car, and 53 percent make it illegal to sit or lie down in particular public places. And the number of cities criminalizing homelessness is steadily increasing.” Our biology keeps us healthy, but also hinders our support of the homeless population. Not only biologically, but psychologically, we have formed opinions of homelessness based on how they are portrayed in the media as well. 73 percent of all media accounts of the homeless have portrayed them negatively; therefore unsurprisingly, 60 percent of those surveyed in a University of Central Florida study agree that homeless people can be dangerous. When exposed to panhandling, the majority either never gives money, only gives once a month or gives once or twice a year. A third of the sample did say that their opinions on homelessness have changed, and it’s almost unanimously because they’ve become more sympathetic. They’ve come to realize the state of the economy and understand why some have to live their lives as they do. Most recent data shows the rate of homelessness is still rising, with homeless young adults and children accounting for the largest increases. These statistics are forcing states to reevaluate their approach to ending homelessness. Anonymous. “Solving the Homeless Problem in N.D.” Bismarck Tribune, 11 June 2014, bismarcktribune.com/news/opinion/editorial/solving-the-homeless-problem-in-n-d/article_d080e094-f0ef-11e3-8a41-0019bb2963f4.html. Belson, Ken. “Building a Stadium, Rebuilding a Neighborhood.” The New York Times, 12 Jan. 2017, www.nytimes.com/2017/01/12/sports/football/atlanta-falcons-stadium-arthur-blank-neighborhood.html. Cooper, Ryan. “Solving Homelessness Is Easy. So Why Don't We Just Do It?” The Week , 3 Sept. 2015, theweek.com/articles/575133/solving-homelessness-easy-why-dont-just. Coventry, Kate. “What’s In the Fiscal Year 2018 Budget for Homeless Services? .” DC Fiscal Policy Institute, 27 July 2017. Elena. “Top 13 Cities With Highest Homeless Population In The World.” Trendrr, 2 July 2018, www.trendrr.net/13046/top-cities-with-highest-homeless-population-world-famous-lowest/. Elliot, Megan. “Poverty: 10 Cities With the Most Homeless People.” The Cheat Sheet, 11 May 2018, www.cheatsheet.com/culture/cities-with-the-most-homeless-people.html/. Greenstone, Scott. “How Much Do Seattle and King County Spend on Homelessness?” The Seattle Times, The Seattle Times Company, 22 July 2018, www.seattletimes.com/seattle-news/homeless/how-much-do-seattle-and-king-county-spend-on-homelessness/. Holland, Gale. “Los Angeles County Spends $1 Billion Managing Homelessness, Report Finds.” Los Angeles Times, 5 Feb. 2016, www.latimes.com/local/lanow/la-me-county-homelessness-spending-20160205-story.html. Kever, Jeannie. “Competing Attitudes about the Homeless Complicate Public Policy.” No. 347: Schrodinger's Cat, 7 Aug. 2017, www.uh.edu/news-events/stories/2016/October/10242016Attitudes-Toward-The-Homeless.php. McAnaney, Patrick. “Adams Morgan Is Losing Diversity, but Is New Development the Culprit?” Greater Greater Washington, 10 July 2018, ggwash.org/view/67565/adams-morgans-diversity-drop-is-what-happens-when-we-dont-build-enough-housing. McSwain, Dan. “Big Spending, Fewer Results for Homeless.” The San Diego Union-Tribune, 5 Sept. 2016, www.sandiegouniontribune.com/business/sdut-big-spending-few-results-homelessness-2014feb11-story.html. Perry, Francesca. “'We Are Building Our Way to Hell': Tales of Gentrification around the World.” The Guardian, Guardian News and Media, 5 Oct. 2016, www.theguardian.com/cities/2016/oct/05/building-way-to-hell-readers-tales-gentrification-around-world. “Proven Solutions.” Coalition For The Homeless, www.coalitionforthehomeless.org/ending-homelessness/proven-solutions/. Pyke, Alan. “Extreme Wealth And Absolute Squalor: Homelessness In Silicon Valley.” ThinkProgress, 28 May 2015, thinkprogress.org/extreme-wealth-and-absolute-squalor-homelessness-in-silicon-valley-c8df0e633ed/. Quigley, Bill. “10 Facts About Homelessness.” The Huffington Post, 6 Dec. 2017, www.huffingtonpost.com/bill-quigley/ten-facts-about-homelessn_b_5977946.html. Rascon, Jacob. “Utah's Strategy for the Homeless: Give Them Homes.” NBCNews.com, NBCUniversal News Group, 3 May 2015, www.nbcnews.com/news/us-news/utahs-strategy-homeless-give-them-homes-n352966. Rawes, Erika. “The 10 Richest Cities in America.” USA Today, Gannett Satellite Information Network, 25 Jan. 2015, www.usatoday.com/story/money/personalfinance/2015/01/25/cheat-sheet-10-richest-cities/21394881/. “The State of Homelessness in America.” National Alliance to End Homelessness, 2017, endhomelessness.org/homelessness-in-america/homelessness-statistics/state-of-homelessness-report/. United States, Congress, Office of Community Planning and Development. “HUD Exchange.” HUD Exchange, 15 Jan. 2008. www.hudexchange.info/resources/documents/counting_unsheltered.pdf. Wright, James D., et al. Public Perceptions of the Homeless and What Needs to Be Done: Summary Report. University of Central Florida, 2009, pp. 1–7, Public Perceptions of the Homeless and What Needs to Be Done: Summary Report.